Sightline Systems, a real-time operations intelligence solution company, has released Sightline Assure 2.0. Now Sightline Assure users can easily monitor multiple servers, access control servers, applications, storage devices, network devices, peripherals such as cameras and door locks and more. New views and customized dashboards make the Assure 2.0 product easier than ever to use. The tool also enables continuous monitoring in order to predict performance issues and prevent unplanned downtime and data loss. Assure 2.0 can restart failed applications, or even alert on a full storage array. "The new Sightline Assure capability dovetails into our manufacturing strategy because manufacturers are leveraging business analytics for IIoT monitoring and to better understand and optimize the manufacturing process," commented Brandon Witte of Sightline Systems. "At Sightline Systems, we are committed to the manufacturing industry and see a very bright future where successful companies leverage all types of data from PLCs and sensors to substantially enhance productivity, increase efficiency and expand overall operations." 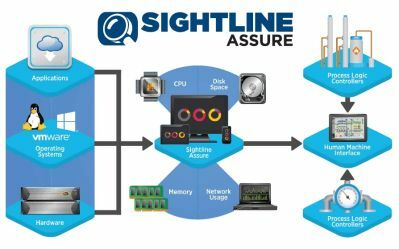 Sightline Assure 2.0 is poised to provide an unprecedented ability to view systems across the entire stack, from the hardware to the OS, applications, networking devices, storage arrays and more enabling users to proactively diagnose, address, restart and remedy issues quickly. Assure is the perfect solution to ensure mission-critical applications are continuously up and running, with no downtime or data loss and will also provide opportunities for product improvement and data management from the IIoT space. Sightline Assure is used by world-renowned global companies to provide full visibility into the entire IT environment without the complexity of traditional IT-industry software. Perfect for analysis and visualization of the data, Assure boils down more than 700 different metrics into easy-to-understand and actionable notifications. Its user-friendly, graphical dashboard highlights all active alerts and provides a comprehensive history for all mission-critical servers, operating systems and monitored applications. Sightline Assure helps users gain more real-time knowledge about the issues, when they began, how long they've lasted and if they could be restarted.